Due to the increasing population, the demand for crude oil, natural gas, and refined products is expected to increase in the coming years. The governments in several countries are either investing or encouraging private sector investments, to build pipeline network across their countries and supply natural gas and refined products to end consumers. 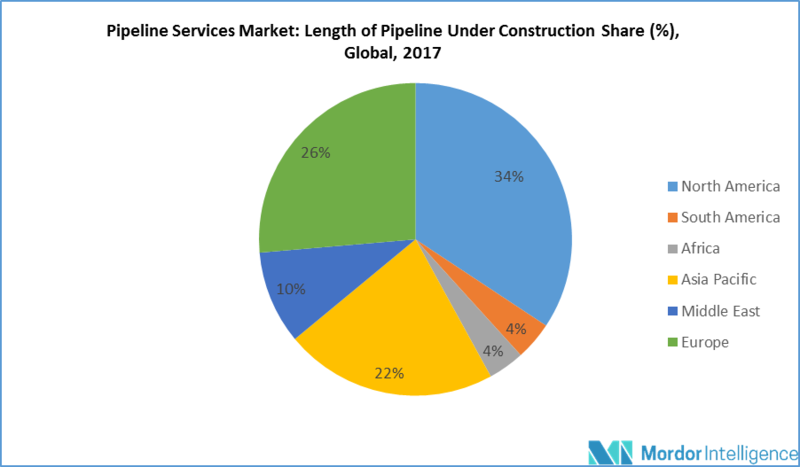 As of 2017, more than 40,000 miles of pipeline network was under construction across the globe, which is expected to drive the pipeline services market during the forecast period. Natural gas is a clean fuel. With increasing concerns and regulations related to air pollution, countries across the globe are shifting from oil to gas consumption. In 2016, gas consumption of large economies, such as France, Germany, the United Kingdom, Israel, Egypt, China, and India, recorded a CAGR of over 7.0%. The trend is expected to continue during the forecast period. With the increasing demand for natural gas, the demand for new pipelines is expected to increase. Gas pipelines usually have higher mechanical specifications than oil pipelines, which make them more expensive. Additionally, gas pipelines require more frequent inspection. Therefore, the growing consumption of natural gas is expected to have a significant positive impact on the market. In 2016, Asia-Pacific accounted for around 34% and 20% of crude oil and natural gas consumption respectively, and was one of the largest segments of the oil & gas pipeline fabrication and construction market. In Asia-Pacific, India and China are expected to lead the market, as both the countries are planning to expand their pipeline network, to meet the increasing oil & gas demand. As of June 2017, China had 112,000 km of oil and gas pipeline and is expected to reach 240,000 km by 2025. Further, in India, gas pipeline infrastructure was 16,470 km, as of September 2017. As of October 2017, India is the fourth largest importer of LNG and domestic LNG demand is expected to touch 90 billion cubic meters (bcm), from 21.3 bcm in 2017-2018 (April-November). In January 2018, the Indian government announced that five public sector undertakings (PSUs) would form a special purpose vehicle (SPV) to create mega natural gas pipeline network in the northeastern part of the country. As a result, the increasing demand for energy is expected to drive the demand for oil & gas pipeline, in turn driving the pipeline services market. The United States is one of the largest consumers of crude oil and natural gas (accounts for almost 20% of the global consumption). The country is planning to increase the share of natural gas in its energy mix. Several large inter-state natural gas pipeline networks have come online during the past few years. In 2016, the Federal Energy Regulatory Commission (FERC) certified the construction of 17.6 billion cubic feet per day (bcf/d) of new natural gas pipeline capacity. Between January 2017 and March 2017, more than 7.0 bcf/d was certified by FERC. The increasing oil & gas pipeline capacity in the United States is expected to drive the market studied. February 2018: L&T Hydrocarbon Engineering Limited (LTHE), a subsidiary of Larsen & Toubro, signed an EPC contract with Al Dhafra Petroleum Operations Company Limited, UAE, for a value in excess of INR 2.2 billion. The scope of the contract includes EPC of flow lines, gathering facilities, and pipelines to transfer crude oil and natural gas. Major Players: Snelson Companies Inc., Bechtel Corporation, Pumpco Inc., Tenaris, Sunland Construction Shengli Oil & Gas Pipe Holdings Limited, Gateway Pipeline LLC, Ledcor Group, and Larsen & Toubro Limited, among others. Current and future pipeline services market outlook in the developed and emerging markets.